I’m not one to read those magazine articles that assume that every woman needs certain items of clothing in her wardrobe, such as a little black dress and other nonsense (I’m not one to read any of those magazines, period. Not anymore. You wouldn’t believe how much my self-esteem has improved since I’ve restricted my magazine buying to Burda and other craft related periodicals). It’s kind of ironic that I’m saying that when my last blog post featured what could obviously be described as a [shudder] LBD, but seriously, I lived without a LBD for most of my life and I didn’t feel the need for one like, ever! Anyway, rant over I guess. 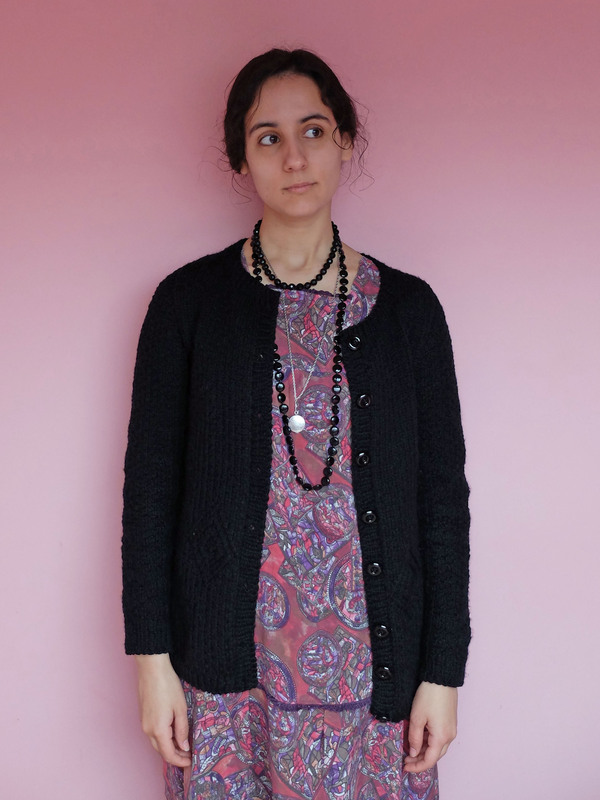 What I wanted to tell you was that a black cardigan was one of the rare garments I felt I needed. 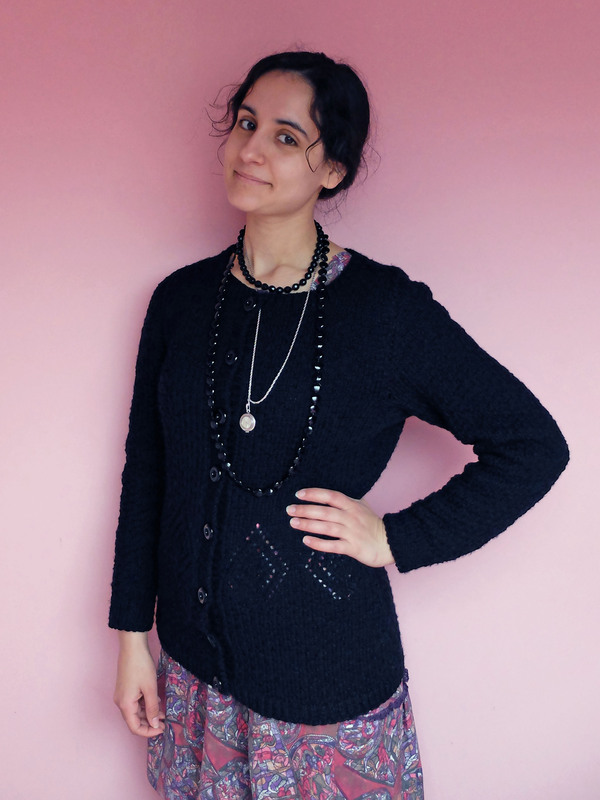 I used to own a store-bought one that you can see here (I don’t know why I’m bothering linking to that picture: everybody knows what a black cardigan looks like, don’t they? ), but it died and I’d been missing it sorely ever since. 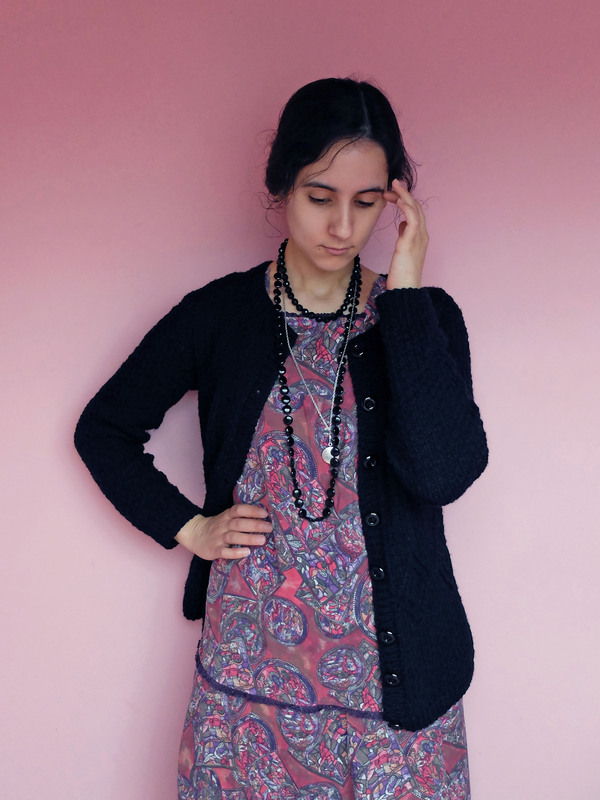 There were a few pieces in my wardrobe, such as the dress you see in the picture I absurdly linked to a few rows above, that I always wanted to wear with a black cardigan. But it’s also so much more appealing to knit colourful yarn that boring black yarn, isn’t it? 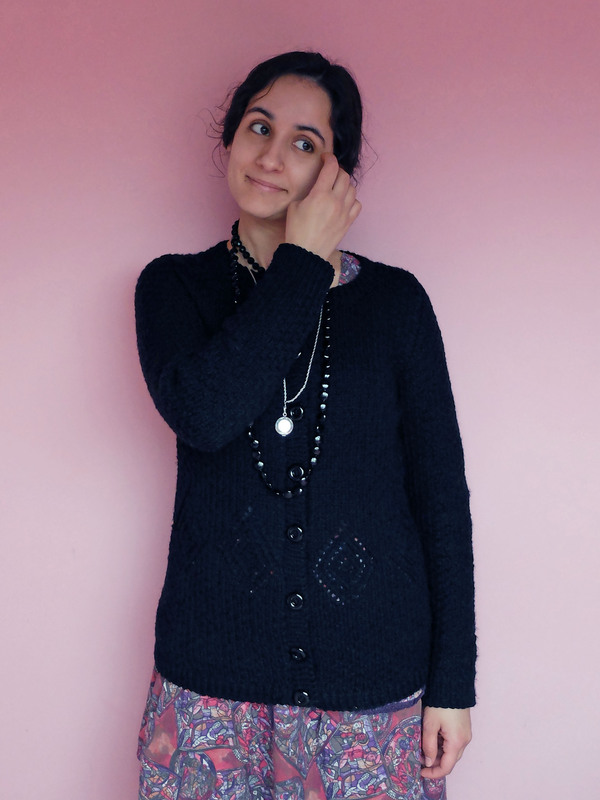 So each time I started a new knitting project, it didn’t even cross my mind that I could make that black cardigan. Smiling is for the weak. Enter Zinnia. I don’t know why, but when I was perusing my favourite yarn shop (no link because it recently closed doors and I’ll be sad about it forever 😦 ) to choose some yarn for that project, for once I was drawn to grey and black. The various greys that were available in the shop didn’t really appeal to me, so I chose black. And I am so happy I did! Not only was the black yarn not boring at all to knit (annoying maybe; it was a cat hair magnet! – not so much since I completed it, weirdly! 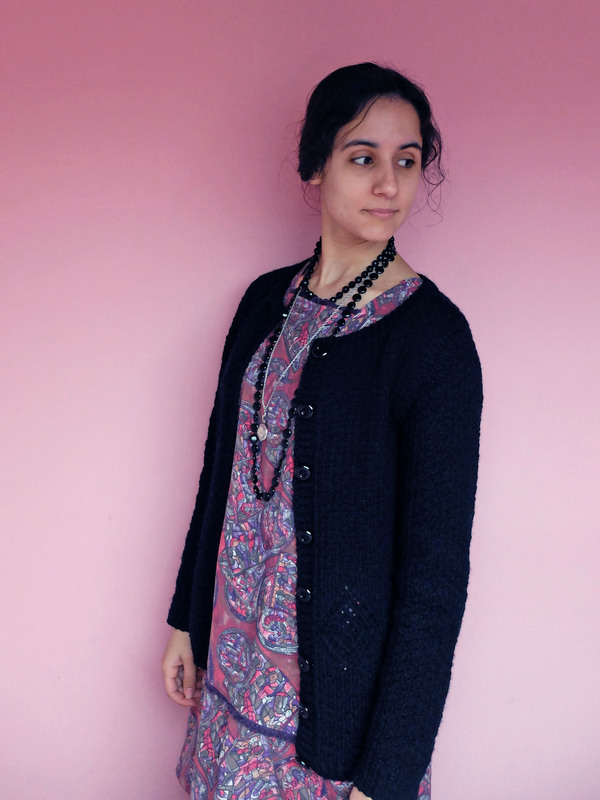 ), but I finished this knit two weeks ago and I’ve already worn it so often: it seems like a black cardigan does go with everything. 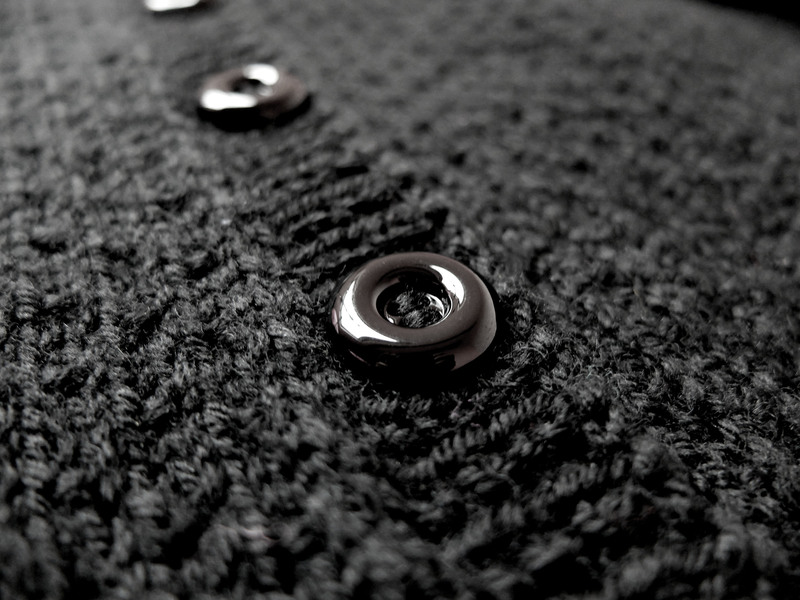 I also like the way the textured stitch looks in black. I was afraid the dark colour would hide it, but it doesn’t and I think it looks great. The yarn is Drops Karisma, a superwash yarn which I’ll definitely use again in the future. I really enjoyed knitting this pattern: the textured stitch kept things interesting yet it was very straightforward to follow. The lace diamonds, too, were a pleasure to knit: I placed markers between each repeat, which I always do when I’m knitting lace, and it made things easy as pie. You can find my Ravelry notes here. When in-between sizes as is often the case with Andi’s patterns, I usually choose knitting a size smaller, which is best with all those close-fitting cropped sweaters I love knitting/wearing, but for this one I preferred going a size bigger since it was supposed to be looser-fitting. And I’m glad with the result: I can comfortably layer one or two long-sleeved tees under it, yet it doesn’t look too loose-fitting either when I’m only wearing one layer of short or 3/4 sleeves. 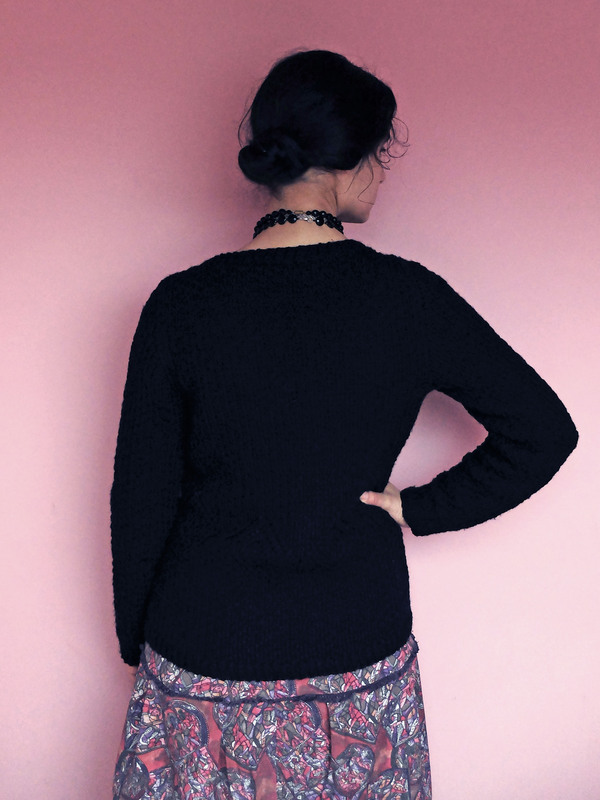 I should be back in not too long with another knit, and then with that skirt I started two months ago. Both are finished and just need to be photographed, alas we all know “just” photographing our sewing projects is even less of a small feat in winter than during the rest of the year! Thank you so much! 🙂 I didn’t find black really hard on the eyes to knit, but I have to say I did feel the need to turn on one more light than usual when knitting at night. Oh, and you shouldn’t hate on the stockinette: you can knit and talk/watch TV/read blogs at the same time without risking any dreadful mistakes! 😀 So if you still feel like wearing the end result, I can only encourage you to complete that cardigan you started last winter! Bref, j’admire le boulot sur ce gilet-ci, parce que je trouve que tricoter du noir, qui plus est avec un motif un poil compliqué, c’est quand même … laborieux !! C’est fou hein cette histoire de PRN?! Ça m’a toujours un peu consternée. Là j’ai légèrement l’air con puisque je viens de m’en coudre une, mais vraiment, contrairement au gilet, pas une fois dans ma vie je ne me suis dit que c’était un truc qui me manquait! Sinon pour ce qui est de tricoter du noir, et attention c’est une amoureuse/passionnée/obsédée des couleurs qui le dit, franchement c’était un plaisir! Et le motif n’est vraiment pas compliqué: c’est comme des côtes mais en bieeeen plus fun et rapide! Beautiful knitting. Black is underrated but looks great with most things. I need to start by some black fabric. Thank you so much! 🙂 Yes, black does look great with most things, it’s a really easy (non-)colour to wear! Comme d’habitude j’adore! Savoir tricoter c’est tout de même bien pratique…! Mais peut-être pas si on vit dans l’hémisphère sud! 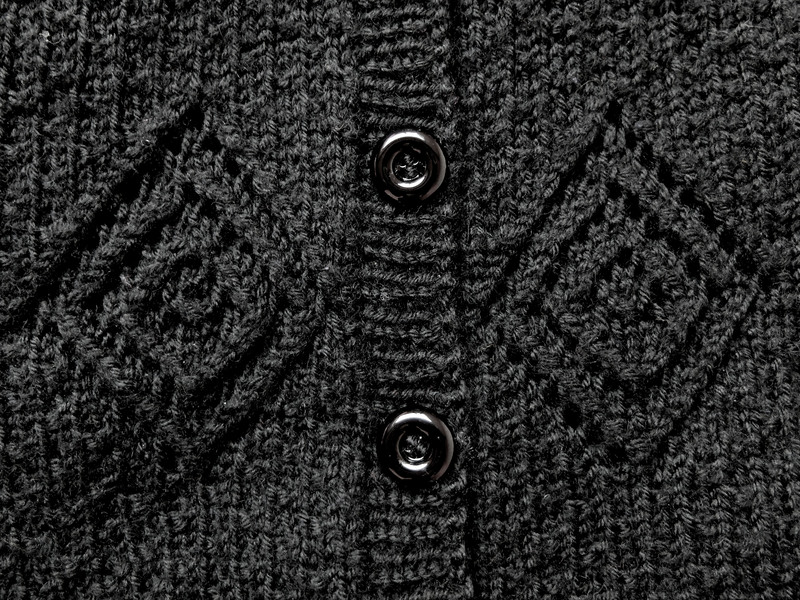 There is nothing like having the perfect black cardigan. I really want to make Zinnia. I just love the coziness of this cardigan.